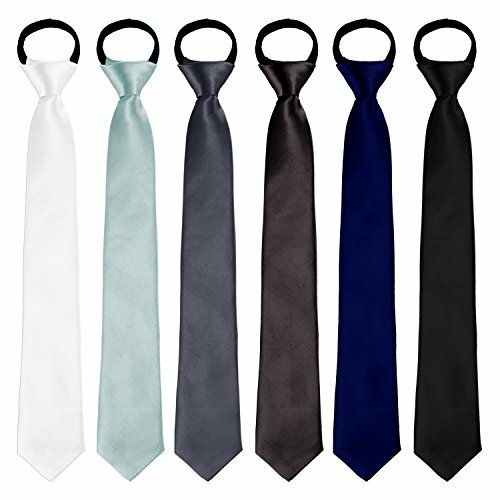 Coobey 6 Pack Boys' Satin Zipper Neck Tie Pre-tied Adjustable Neck Strap Tie (15 Inch, Light color set) by Coobey at SCRHI. MPN: 43225-14260. Hurry! Limited time offer. Offer valid only while supplies last. Specifications: Size: The length is approx. 15 inches from the tip of the tie to the top of the knot, and the maximum width of the tie is approx. Size: The length is approx. 15 inches from the tip of the tie to the top of the knot, and the maximum width of the tie is approx. 1.96 inches. Unique zipper design: Boys' zipper necktie, easy for little boys to put on and take off tie by themselves, practical to adjust the neck size of tie according to children's need. Available in 6 different colors: 6 neck ties come in 6 different colors for each package, various colors provide more options, go well with different dress shirts, suit etc. Material and dimensions: The necktie is made of good quality glossy satin, with a slight shimmer, soft and comfortable to touch. The length is approx. 15 inches from the tip of the tie to the top of the knot, and the maximum width of the tie is approx. 1.96 inches. Easy to use: The zipper on the tie allows you to tighten or loosen the tie easily; The necktie has already been tied, so you just need to pull the tail or the neck loop of the back piece to adjust neck size, very easy to put on and remove the tie. Wide application: Elegant and nice-looking zipper necktie for kids to wear in a wedding, great for ring bearer, as props for photo booth, look great with the boy's dress shirts, suit and uniforms, great addition to kids' suit for First Communion, special and practical gift for family members and friends. If you have any questions about this product by Coobey, contact us by completing and submitting the form below. If you are looking for a specif part number, please include it with your message.